Hello friends. Well, I'm glad to back from my blogging break! I hope you all had a great 4th of July. I had a really nice day and we packed everything up early and headed to the beach. It was a little crowded but we enjoyed ourselves since the water was so warm to swim in. We also enjoyed watching the fireworks. 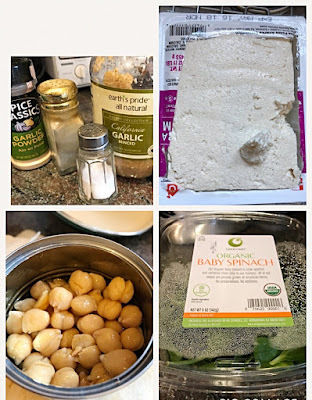 I recently found an awesome recipe a while back from my blogging buddy Heather, who blogs at Our Life In a Click. She loves cooking Vegan and healthy foods for her family. 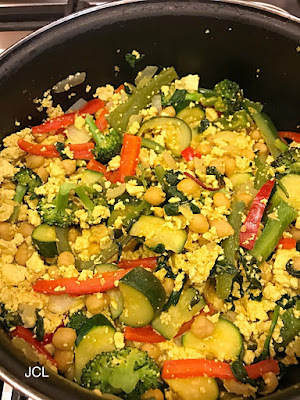 Heather recently made a Tofu Scramble that she shared on her blog. 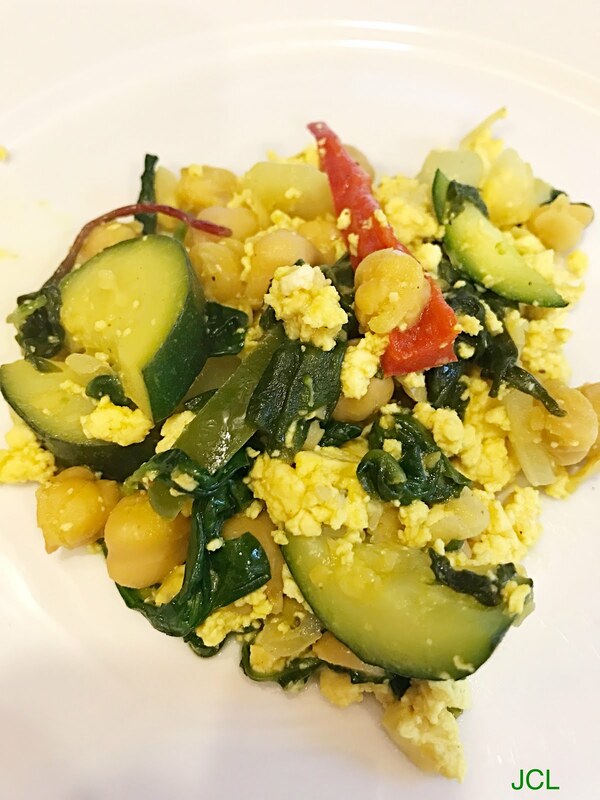 This dish is great for people that do not like to eat eggs since there are no eggs in this recipe. For the recipe, you use tofu instead of eggs. 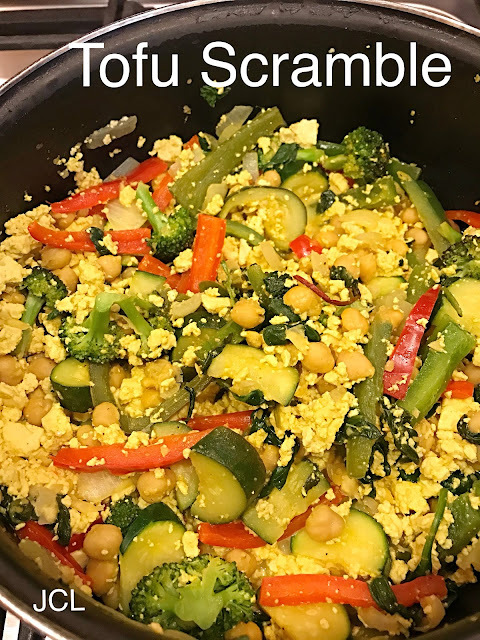 To see the recipe on how to make this tofu scramble you can click HERE. We all are trying to eat healthier so I decided to try out this recipe since it looked so good. I made this recipe a few weeks ago and we all loved it and it tasted just like eggs. 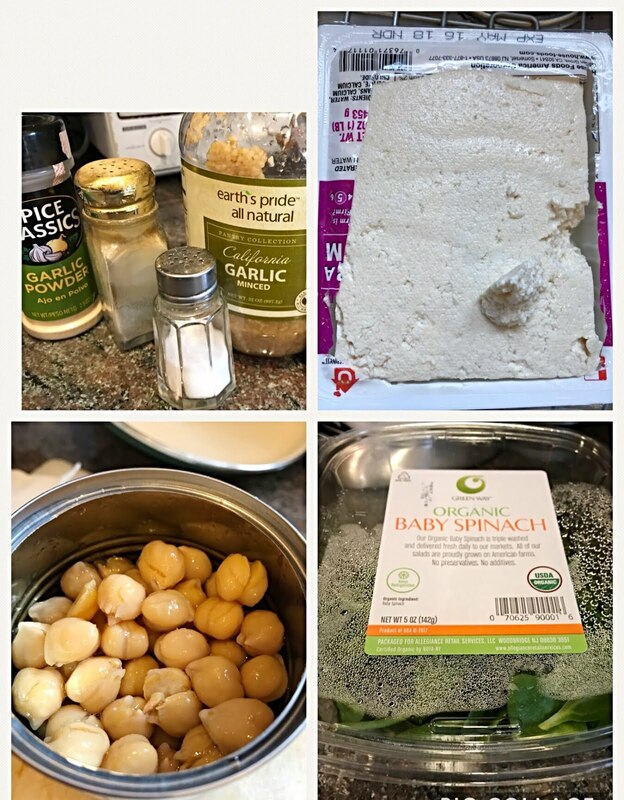 I gathered some of the ingredients along with salt, pepper, garlic powder, firm tofu, a can of rinsed and drained chickpeas, and some baby spinach. I also added a package of vegetables that included broccoli, red and green peppers, and onions that were cleaned and chopped up already. I let all of that simmer in a large pot with olive oil for a few minutes. I next added in drained and crumbled up tofu to the veggies. I let that all cook for a while. I next added in some tumeric for flavor and coloring. I did not have all of the ingredients that were in the recipe and left out the aminos and brussel sprouts. I let this all cook for a while until the veggies were all cooked through. 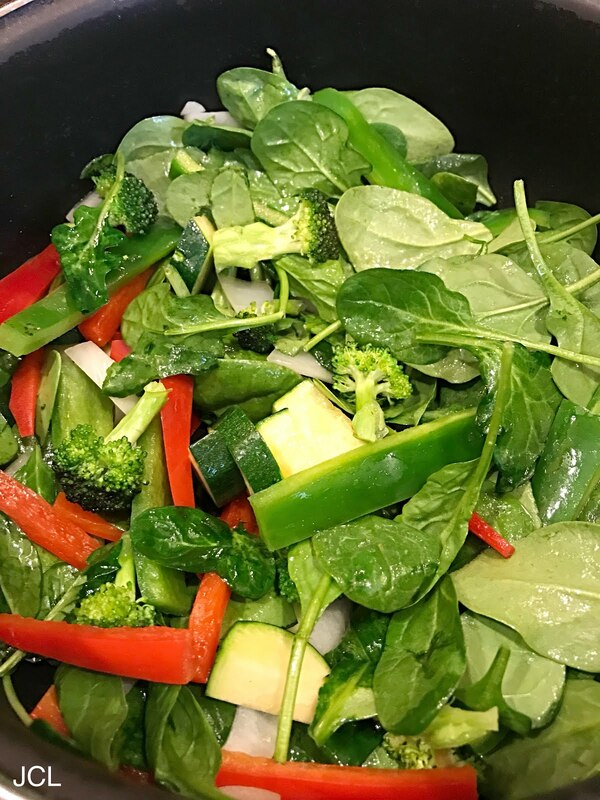 My daughter and I really loved this dish and she had hers with brown rice and I had mine with whole wheat toast for dinner. This dish is great for breakfast, lunch, or dinner! Thanks, Heather for the recipe to make this tofu scramble. It really does taste like eggs and vegetables. 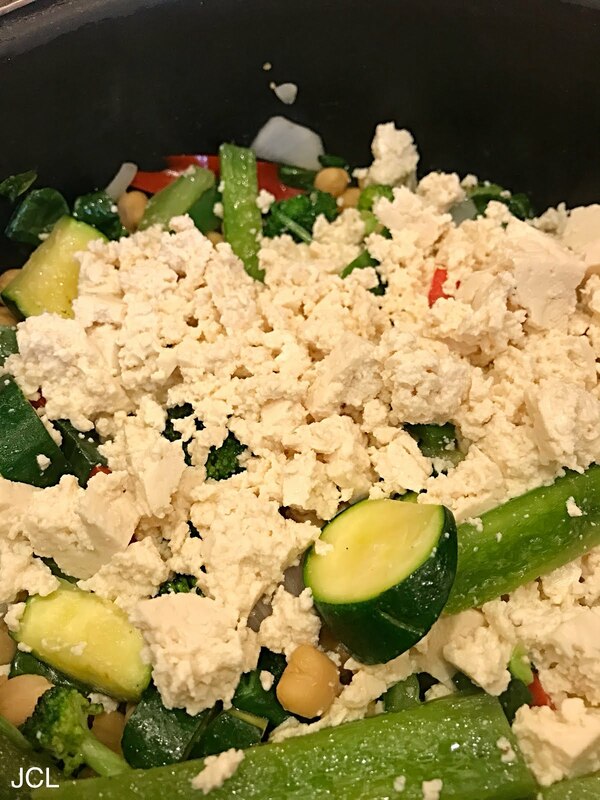 I hope some of your will also be inspired to cook this healthy tofu scramble. Don't forget to stop by for our Monday Cooking and Crafting with J & J Link Up! Lots of wonderful healthy ingredients....I know I would love it! Hugs! My oldest daughter is vegan. She cooks a lot of meals like this one. Thanks for sharing Julie! Hey Julie! I've never tried tofu... I've always wondered if it was good. This looks like an easy recipe. I'll let you know :) Have a great rest of the week friend! Thank you so much for sharing my recipe!! I'm so glad you and your daughter like it. I make it every week and my daughter and I eat it during the week. Love it! I think I make it a little differently every time! I must try this! I am trying to cut down on eggs because of high bad cholesterol and I just happen to like tofu! I will be the only one in the house eating it though, which is fine with me. This looks pretty yummy and good. Have a fabulous evening Julie and a great Friday and weekend. My kids make vegan eggs all the time. I am going to show them this recipe for a little variety. I know they'll love it. Glad you enjoyed your break...that's what summer is all about! This looks really yummy and full of veggies that I love. I will have to make this soon. Thanks for sharing Julie. Have a wonderful week! Thanks so much for sharing at Best Of The Weekend, Julie! Sounds yummy!